The word commencement means a beginning or a start—and yet it’s applied to a ceremony that marks the culmination of years of scholarly labors oriented toward the goal of obtaining a college degree. Indeed, for many of the approximately 3,200 UC Santa Cruz students in ceremonies this past weekend the occasion marks a culmination—the final step of a process that began in kindergarten. Many of the Banana Slugs have taken their last test, written their final paper, received one last grade. But for many the word commencement describes this transformative step perfectly, as the 2018 UC Santa Cruz graduates embark on postgraduate careers, taking the principles, ideas, and relationships they collected during their time in Santa Cruz with them as they start a new chapter in life. 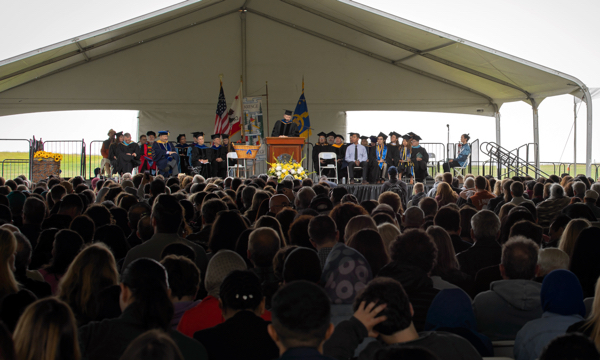 The concept of new beginnings was a theme returned to over and over by the various commencement speakers that prefaced each ceremony with words of encouragement blended with entreaties for graduates to carry forward both the ideas and ideals they acquired while at UC Santa Cruz. “Employ your ingenuity and brilliance to try and improve our world,” said Kingsley Odigie, an environmental scientist who earned his degree from UC Santa Cruz in 2012, during the Graduate Division commencement ceremony on Thursday afternoon. Odigie also urged graduates to make further strides on the social justice front, with the elimination of systemic racism and crippling economic inequality high on the list of challenges faced by those graduating into the world. Poet Ziggy Rendler-Bregman, a member of UC Santa Cruz’s first graduating class, offered more personal and reflective advice during her speech for Porter College graduates on Saturday morning. As to the nature part, Santa Cruz’s unpredictable weather played a central role throughout the weekend, with fog rolling off the ocean making for some chilly ceremonies, particularly in the morning. But in true Central Coast style, the sun often broke through, burned off the fog, and displayed the peerless beauty of the UC Santa Cruz campus. The East Field offered some stunning views of the Monterey Bay, while the newly renovated Quarry Amphitheatre provided intimacy as the graduates’ names echoed off the rock walls and the branches of coastal redwoods hanging at the quarry flanks. “The trees were one of the main reasons I came here,” said Benjamin Stevenson, who received a Master of Arts in education. It was a refrain through the weekend. “I think the thing I’ll remember most is just the campus,” said Maxwell Lee, who earned a Master’s of Science in applied economics and finance. Katie Silva-Grizzle said she’ll always remember the Porter College dorms, not only for the beauty of the setting but also the opportunity to meet people and make friends. Silva-Grizzle, who graduated with a bachelor’s degree in cognitive science, wants to teach elementary school. Lee wants to open a restaurant, and Stevenson said he wants to travel while he is young, with plans to visit Thailand and see the rest of the United States. While many students took time to remember the idyllic setting that framed their college years, some were more intent on savoring the moment after overcoming a series of obstacles on their way to achieving their degree. Cruz wore a dress for graduation with the traditional colors of the Mexican flag stitched horizontally. When her name was called, she twirled to raucous applause. Cruz, who is undocumented, came to the United States from Mexico when she was 10, endured a hardscrabble youth in East Los Angeles and countless high school counselors who told her she’d never make it, she would not amount to much, and that she should find low-paying jobs upon graduating high school. She did not listen and now she will head back to East L.A., degree in hand, with plans to become a high school counselor intent on inspiring young people’s dreams rather than working to tamp them down. Cruz’s optimism about the future both immediate and long-term was shared by others throughout the weekend proceedings, as graduates said they look forward to their next chapter with that bittersweet mixture of excitement and anxiety. “I guess I’m a little bit nervous, but not too concerned,” said Griffin Dey, who earned a degree in environmental studies on Saturday. He aims to get a job helping identify new sustainable food systems, while helping increase access to food for all. Dey said the friends he made at UC Santa Cruz will be the thing he will remember most about his four years on the hill above the bay, but he also noted that as he seeks to make a positive difference in communities, his time as a Slug has rendered him ready.